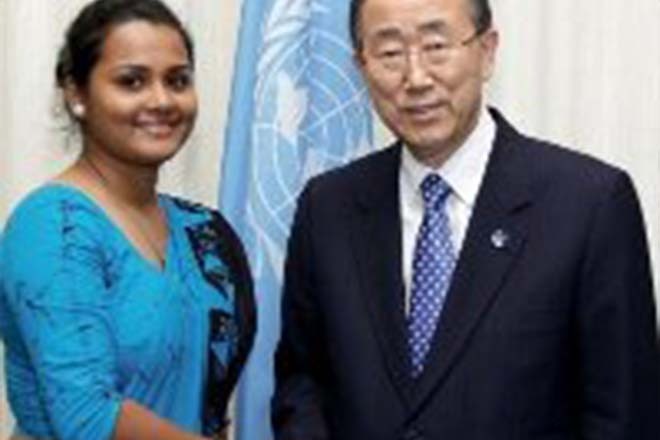 (PRESS RELEASE) – United Nations Secretary-General’s office announced today (20th June) that Secretary General António Guterres has appointed Jayathma Wickramanayake of Sri Lanka as his next Envoy on Youth. She will succeed Ahmad Alhendawi of Jordan. Presently working as an officer of the Sri Lanka Administrative Service, she has previously served as Secretary to the Secretary General of the Parliament of Sri Lanka (2016-2017), Project Officer-Youth, One-Text Initiative in Sri Lanka (2015-2016), Member and Youth Lead Negotiator, International Youth Task Force of the World Conference on Youth 2014 (2013-2014) and Official Youth Delegate to the United Nations, Ministry of Youth Affairs and Skills Development (2012-2013). She also served briefly as the Third Secretary at the Permanent Mission of Sri Lanka to the United Nations in New York (2014). She was furthermore a Senator in the Sri Lankan Youth Parliament (2013-2015). In this role, Wickramanayake is expected to expand UN’s youth engagement and advocacy efforts across all four pillars of work – sustainable development, human rights, peace and security and humanitarian action. She will also play a lead role in realizing the Secretary-General’s vision on youth, which places young people as a cross-cutting priority of the UN; ensures that young people’s perspectives are reflected across all pillars of the UN’s work; and places young people’s interests at the centre of the Secretary-General’s agenda for crisis prevention and sustaining peace by leveraging their talents, energy and innovation in addressing youth challenges and fostering opportunities. Born in 1990, Wickramanayake is reading for Master of Development Studies, at the University of Colombo and holds a Bachelor degree in Science, from the same university.